Eric left on the snow machine with film maker Marco about 15 minutes before us and left the familiar track made by his sled for us to follow. The trail set out across the lake towards some big hills, off the end of the lake and into bushes and soft snow. The sky was overcast and I think it started to snow. With mountains on either side navigation was fairly straightforward, we were being channelled towards a T junction where we would cross a wide river and then head up and over Rainy Pass, that junction was a long way off. 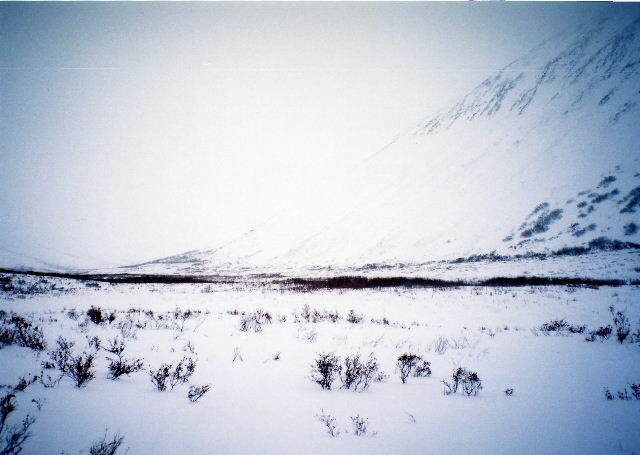 The bushes thinned out and soon disappeared, Eric's trail was gone, blown over by the wind and fresh snow. No trees meant no orange reflectors, instead the trail was marked by wooden tripods about 6-8 feet high, made from three tree trunks. I'd say these tripods were maybe 400 metres apart, maybe twice that on occasion but it was always a challenge to try and spot the next tripod. It was during this section that things started to become quite tough, in fact for me it was physically the toughest stage of the whole race. 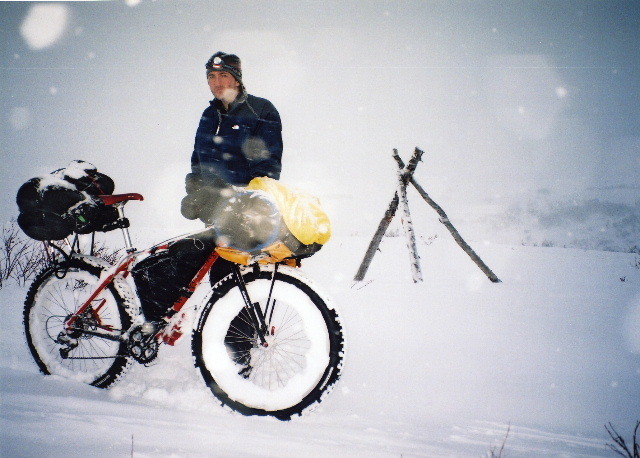 Standing next to one of the tripods it was often difficult to find hard pack snow to walk on, we had long ago forgotten about riding. We frequently sank up to our thighs which really did drain us, climbing out of the hole to move forward half a metre and then fall down again. At it's worst it was taking 20 to 30 minutes to cover 400 metres. I think what made this section mentally bearable was trying to get through it with someone else, the thought of being here on my own, possibly at night time, would have made it a lot harder. As we reached Halfway Lake and a small cabin Tim Hewitt could be seen in the distance. It probably took him less than 30 minutes to reach us. 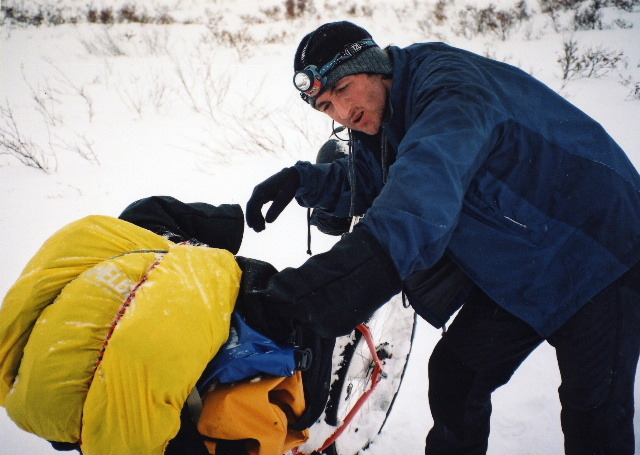 We sat down and chatted for a brief while and then Tim moved on with what seemed like ease, snowshoes preventing him from sinking to his waist. We resumed the chore and slowly found ourselves getting closer to the valley junction, we could still see Tim maybe 400 metres ahead but he seemed to be too far to the left and dropping down too early. He kept stopping, looking around and seemed unsure. From my map I felt that we had to go straight on, cross the river valley and then start to peel left half way across. Unbelievably Tim started to make his way back to us, when he reached us he said his GPS did not seem to be giving sensible directions. I didn't really think a GPS was necessary at this point and referred to my map. We moved forward spread out slightly looking for the next tripod which eventually came into focus. We dropped down into the river valley and looked for any possible sign of where the trail went. We were now back in the bushes and soon came across broken and bent branches that had been hacked by snow machines. This trail became good again, good enough to allow us to ride the few miles across the valley and into the foothills of the mountains that hid Rainy Pass. We were almost at the start of the climb up to the Rainy Pass summit which was still a long way. I think the GPS showed it as a little over three miles as the crow flies, on the map I could see that we had to do a large curve to get there. We decided to stop at this point and cook up some hot food and refill our camelbaks. The idea of clearing Rainy Pass in daylight had failed, we were about to go up in the dark and put to one side tales of whiteout blizzards when you couldn't tell up from down, besides it was not cold and the weather had stayed the same for the last few days. In the dark the trail curved this way and that, riding was impossible, you felt really great when a wind blown section of trail was firm and walking became easy for a few tens of metres. 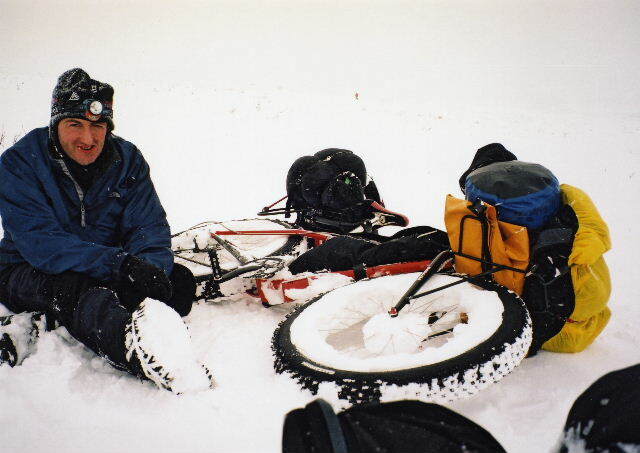 It was more post holing, up to our waists in snow, shoving the bikes ahead and wondering if we were ever going to get to the top. Towards midnight we were both walking next to each other again and thought we could make out the top of the pass, if it was then it had come just in time because we were both physically exhausted. The horizon line drove us on and disappointment crushed us when we realised the trail dropped down to Rainy Pass lake and then climbed back up again. I had experienced a similar situation in 2000 on the Cristalp bike marathon, after 120km of riding, the last 35km up hill you drop down into a bowl and back up, at least that was rideable. This was just devastating. We spoke and without hesitation agreed that we had to continue up and out of the bowl and start heading down, if the trail was bad on the way down we would bivouac. It was around 1am when we finally slogged our way over the top of Rainy Pass, 18 hours after starting and we had covered maybe 30 miles. This was about the half way distance to McGrath and I was totally and utterly shattered. Rohn was still maybe 15 miles away and the trail was deep snow, impossible to ride and a killer to walk. We decided to bivi. We moved down the slope maybe a few hundred yards trying to make out in the weak moon whether we were under a possible avalanche slope. Deciding on a suitable spot we slotted the bikes upright in the snow to act as a feeble wind break and within ten minutes were inside our bags. This was the first bivi and what a place to choose. The wind was howling and the snow was falling. My little thermometer read -15c, luckily no wind chill in the bivi. I managed to get my boots off and placed them up by my head foolishly thinking that they would not freeze. I slunk down into the bag and slept fitfully until about 7 or 8 in the morning.